2005-03-05 Assigned to ALLERGAN, INC. reassignment ALLERGAN, INC. ASSIGNMENT OF ASSIGNORS INTEREST (SEE DOCUMENT FOR DETAILS). Assignors: CHEN, JUNE, WOODWARD, DAVID F.
This patent application is a continuation in part of U.S. patent application Ser. No. 874,441, filed on Jun. 22, 2004 which is hereby incorporated by reference in its entirety. The present invention relates to the use of Abnormal Cannabidiols to lower the intraocular pressure of mammals and thus are useful in treating glaucoma. Ocular hypotensive agents are useful in the treatment of a number of various ocular hypertensive conditions, such as post-surgical and post-laser trabeculectomy ocular hypertensive episodes, glaucoma, and as presurgical adjuncts. The underlying causes of primary glaucoma are not yet known. The increased intraocular tension is due to the obstruction of aqueous humor outflow. In chronic open-angle glaucoma, the anterior chamber and its anatomic structures appear normal, but drainage of the aqueous humor is impeded. In acute or chronic angle-closure, the anterior chamber is shallow, the filtration angle is narrowed, and the iris may obstruct the trabecular meshwork at the entrance of the canal of Schlemm. Dilation of the pupil may push the root of the iris forward against the angle, and may produce pupilary block and thus precipitate an acute attack. Eyes with narrow anterior chamber angles are predisposed to acute angle-closure glaucoma attacks of various degrees of severity. Secondary glaucoma is caused by any interference with the flow of aqueous humor from the posterior chamber into the anterior chamber and subsequently, into the canal of Schlemm. Inflammatory disease of the anterior segment may prevent aqueous escape by causing complete posterior synechia in iris bombe, and may plug the drainage channel with exudates. Other common causes are intraocular tumors, enlarged cataracts, central retinal vein occlusion, trauma to the eye, operative procedures and intraocular hemorrhage. Considering all types together, glaucoma occurs in about 2% of all persons over the age of 40 and may be asymptotic for years before progressing to rapid loss of vision. In cases where surgery is not indicated, topical α-adrenoreceptor antagonists have traditionally been the drugs of choice for treating glaucoma. Certain Abnormal Cannabidiols are disclosed in Howlett et al, “International Union of Pharmacology. XXVII. 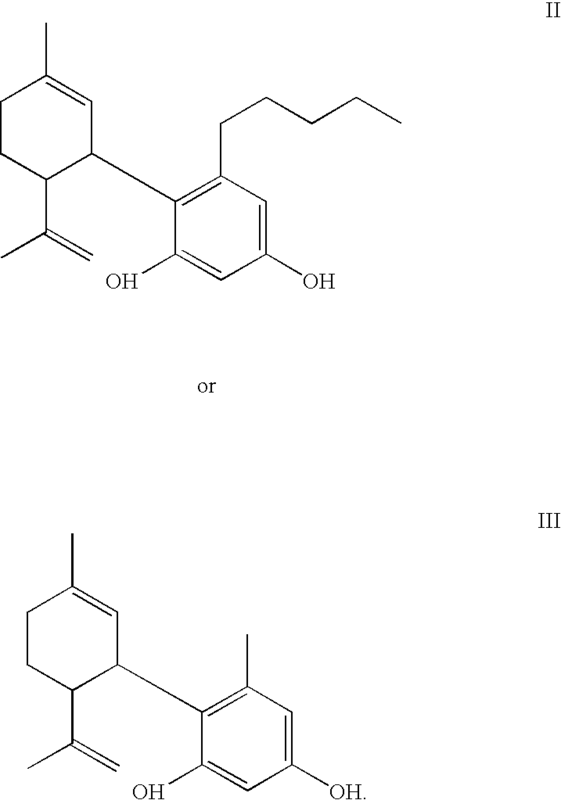 Classification of Cannabinoid Receptors”, Pharmacological Reviews 54: 161-202, 2002. We have found that Abnormal Cannabidiols are potent ocular hypotensive agents. 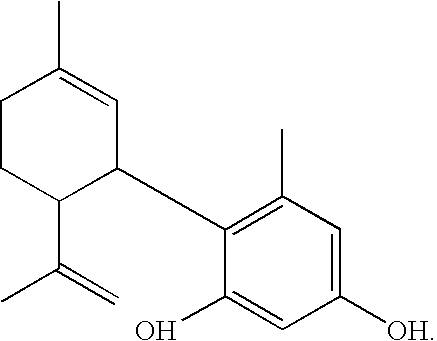 We have further found that Abnormal Cannabidiols and homologues and derivatives thereof, are especially useful in the treatment of glaucoma and surprisingly, cause no or significantly lower ocular surface hyperemia than the other compounds that are useful in lowering intraocular pressure, e.g. PGF2 α and lower alkyl esters thereof. wherein R is selected from the group consisting of (CH2)x wherein x is 0 or an integer of from 1 to 7. In a further aspect, the present invention relates to pharmaceutical compositions comprising a therapeutically effective amount of a compound of formulae (I), in admixture with an non-toxic, pharmaceutically acceptable liquid vehicle. In all of the above formulae, as well as in those provided hereinafter, the straight lines represent bonds. Where there is no symbol for the atoms between the bonds, the appropriate carbon-containing radical is to be inferred. For example in formula II, the radical extending from the phenyl ring is a polymethylene (CH2) radical terminated with a methyl radical, i.e. a butylenylmethyl radical. Pharmaceutical compositions may be prepared by combining a therapeutically effective amount of at least one compound according to the present invention, as an active ingredient, with conventional ophthalmically acceptable pharmaceutical excipients, and by preparation of unit dosage forms suitable for topical ocular use. The therapeutically efficient amount typically is between about 0.0001 and about 5% (w/v), preferably about 0.001 to about 1.0% (w/v) in liquid formulations. Preferred preservatives that may be used in the pharmaceutical compositions of the present invention include, but are not limited to, benzalkonium chloride, chlorobutanol, thimerosal, phenylmercuric acetate and phenylmercuric nitrate. A preferred surfactant is, for example, Tween 80. Likewise, various preferred vehicles may be used in the ophthalmic preparations of the present invention. These vehicles include, but are not limited to, polyvinyl alcohol, povidone, hydroxypropyl methyl cellulose, poloxamers, carboxymethyl cellulose, hydroxyethyl cellulose and purified water. Other excipient components which may be included in the ophthalmic preparations are chelating agents. The preferred chelating agent is edentate disodium, although other chelating agents may also be used in place or in conjunction with it. Especially preservative-free solutions are often formulated in non-resealable containers containing up to about ten, preferably up to about five unit doses, where a typical unit dose is from one to about 8 drops, preferably one to about 3 drops. The volume of one drop usually is about 20-35 μl. The compounds disclosed herein for use in the method of this invention, i.e. the treatment of glaucoma or elevated intraocular pressure, may also be used in combination with other drugs useful for the treatment of glaucoma or elevated intraocular pressure. Prostaglandins including travoprost, UFO-21, chloprostenol, fluprostenol, 13,14-dihydro-chloprostenol, isopropyl unoprostone, latanoprost and the like. Intraocular pressure was measured by applanation pneumatonometry in conscious animals. The test compound was administered topically to one eye while vehicle was given to the fellow eye in a masked fashion. Ocular normotensive Beagle dogs (males, females) were dosed once daily for five days. Laser-induced unilaterally ocular hypertensive Cynomolgus monkeys (females) were dosed once daily for 4 days. Student's paired t-test was used for statistical comparisons. Differences were considered statistically significant if the P-value is less than 0.05. The results are shown in FIGS. 1, 2 and 3. In particular, FIG. 1 shows the effect of 0.1% Abnormal Cannabidiol on Dog Intraocular Pressure versus time. FIG. 2 shows the effect of 0.1% Abnormal Cannabidiol on Monkey Intraocular Pressure versus time. FIG. 3 shows the change from baseline IOP of Monkey dosed with 0.1% Abnormal Cannabidiol versus time. Abnormal Cannabidiol receptor activity may be measured in accordance with the procedure disclosed in (Wagner JA et al., Hypertension 33 [part II], 429 (1999); Járai Z et al., PNAS 96, 14136 (1999), which is hereby incorporated by reference in its entirety. It is apparent to one of ordinary skill in the art that different pharmaceutical compositions may be prepared and used with substantially the same results. That is, other Abnormal Cannabidiols will effectively lower intraocular pressure in animals and are within the scope of the present invention. wherein R is selected from the group consisting of (CH2)x wherein x is 0 or an integer of from 1 to 7 and a second drug selected from the group consisting of β-blockers, adrenergic agonists, carbonic anhydrase inhibitors, cholinergic agonists, chlolinesterase inhibitors, glutamate antagonists, prostamides and prostaglandins. and a second drug selected from the group consisting of β-blockers, adrenergic agonists, carbonic anhydrase inhibitors, cholinergic agonists, chlolinesterase inhibitors, glutamate antagonists, prostamides and prostaglandins. 5. The ophthalmic solution of claim 4 comprising at least one ingredient selected from the group of an ophthalmically acceptable preservative, buffer system, antioxidant and chelating agent. an ophthalmic solution therein, as defined in claim 4. 8. 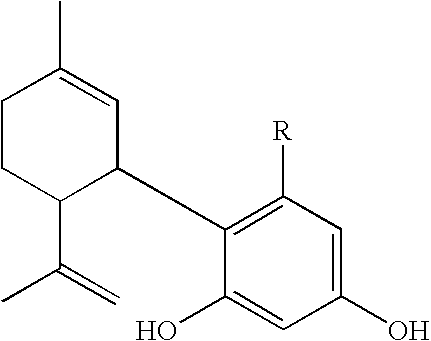 A method for treating glaucoma or intraocular pressure which comprises applying to the eye an amount sufficient to treat ocular hypertension of a combination of drugs which include a first drug which is a compound having Abnormal Cannabidiol activity and a second drug selected from the group consisting of β-blockers, adrenergic agonists, carbonic anhydrase inhibitors, cholinergic agonists, chlolinesterase inhibitors, glutamate antagonists, prostamides and prostaglandins. 9. The method of claim 1 wherein said second drug is a β-blocker selected from the group consisting of carteolol, levobunolol, metiparanolol, timolol hemihydrate, timolol maleate, and betaxolol, or pharmaceutically acceptable salts or prodrugs thereof. 10. The method of claim 1 wherein said second drug is an adrenergic agonist selected from the group consisting of epinephrine borate, epinephrine hydrochloride, dipivefrin, apraclonidine and brimonidine or pharmaceutically acceptable salts or prodrugs thereof. 11. The method of claim 1 wherein said second drug is a carbonic anhydrase inhibitor selected from the group consisting of acetazolamide, dichlorphenamide, methazolamide, brinzolamide, dorzolamide or pharmaceutically acceptable salts or prodrugs thereof. 13. The method of claim 1 wherein said second drug is a cholin esterase inhibitor selected from the group consisting of demecarium, echothiophate, physostigmine, and the like, or pharmaceutically acceptable salts or prodrugs thereof. 15. The method of claim 1 wherein said second drug is bimatoprost or a pharmaceutically acceptable sale or prodrug thereof. 16. The method of claim 1 wherein said second drug is a prostaglandin selected from the group consisting of travoprost, UFO-21, chloprostenol, fluprostenol, 13,14-dihydro-chloprostenol, isopropyl unoprostone, latanoprost or pharmaceutically acceptable salts or prodrugs thereof. ES2246419T3 (en) 2006-02-16 Analogs of omega-cycloalkyl-17-heteroaryl- e2 as prostaglandin receptor agonists ep-2. 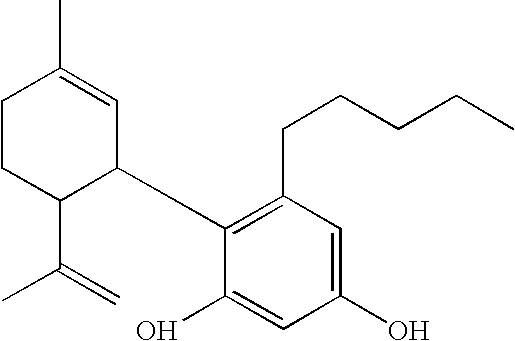 ES2284872T3 (en) 2007-11-16 3,7-acid derivatives as agents for redurir tiaprostanoico p intraocular resion.